Who has the best tech? 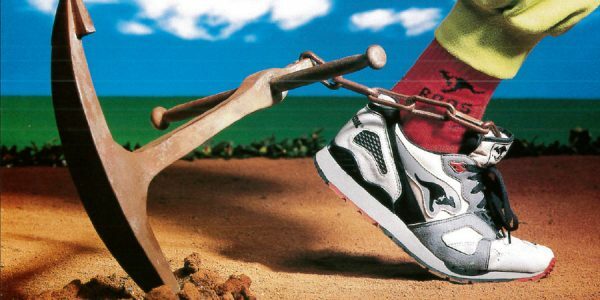 The mid-1980s saw athletic footwear manufacturers locked into an arms race with each brand striving for supremacy by unveiling the next big performance-boosting innovation. 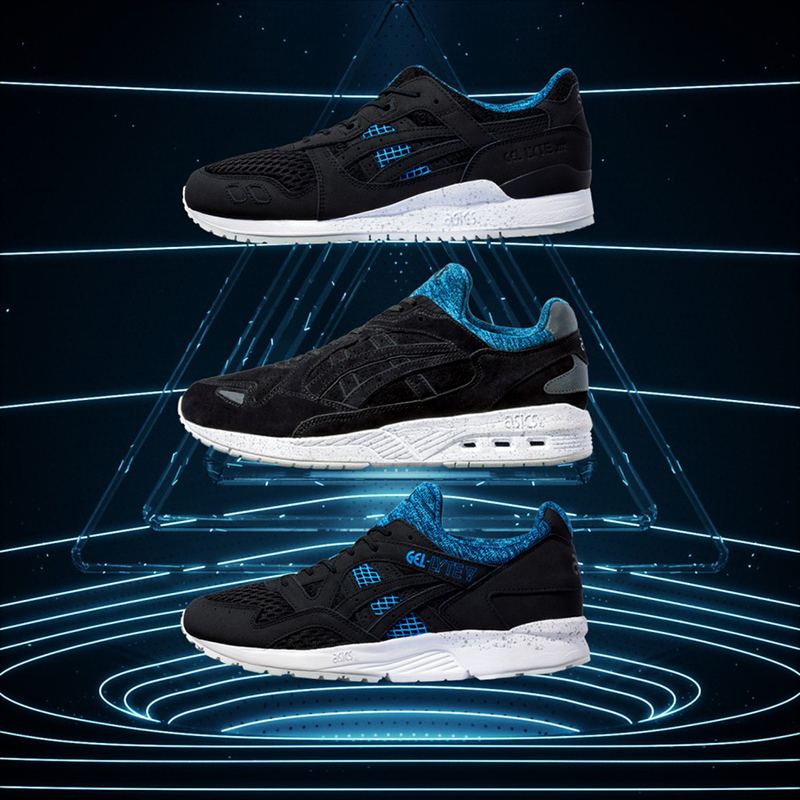 While Nike was going all-in on Air cushioning, ASICS Tiger had been quietly cooking up some marvelous technologies to get runners excited at their research lab in Kobe, Japan. The research lab was initially created by the company’s godfather, Kihachiro Onitsuka, with the aim of raising sports performance through technology in 1979. Since then, it had been pursuing a number of different alternatives to cushioning methods such as sponges and foam that were prevalent in the running segment. One promising approach included “Air Flex” canals inserted into moulded EVA soles for optimized energy return; premiered in progressive runners such as the Alliance model. Better than walking on air? 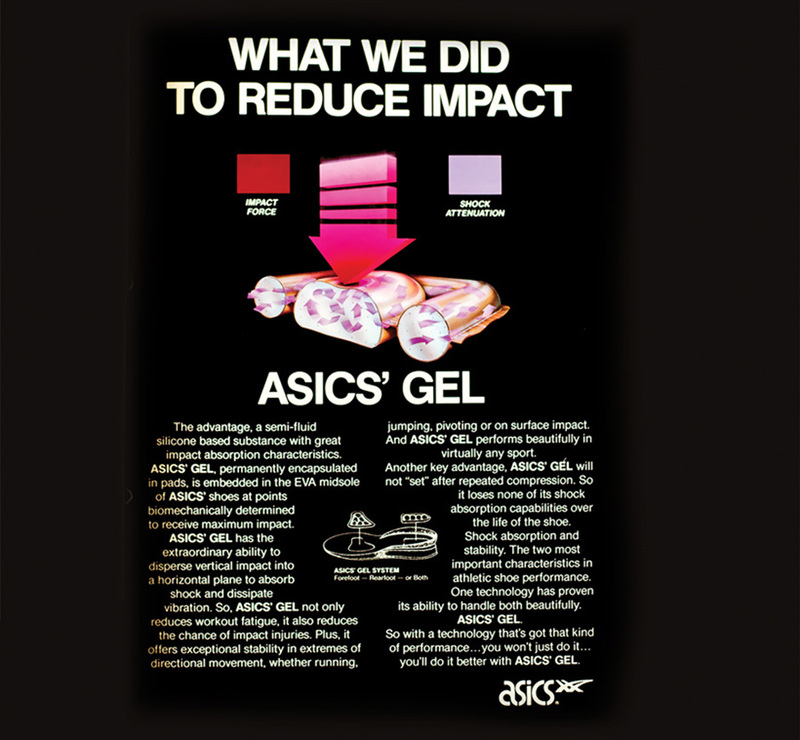 After extensive testing in real-life running experiments, ASICS pursued an alternative to the impact-softening power of air systems: Silicone-based gel, manufactured by Japanese company Taica under the name Alpha GEL. The material already worked wonders in ball point pens and rocket technology. Injected into the EVA midsole of running shoes, Alpha GEL proved effective in diverting the vertical forces of impact during running into horizontal – meaning forward-pushing – leverage. The rest is history. 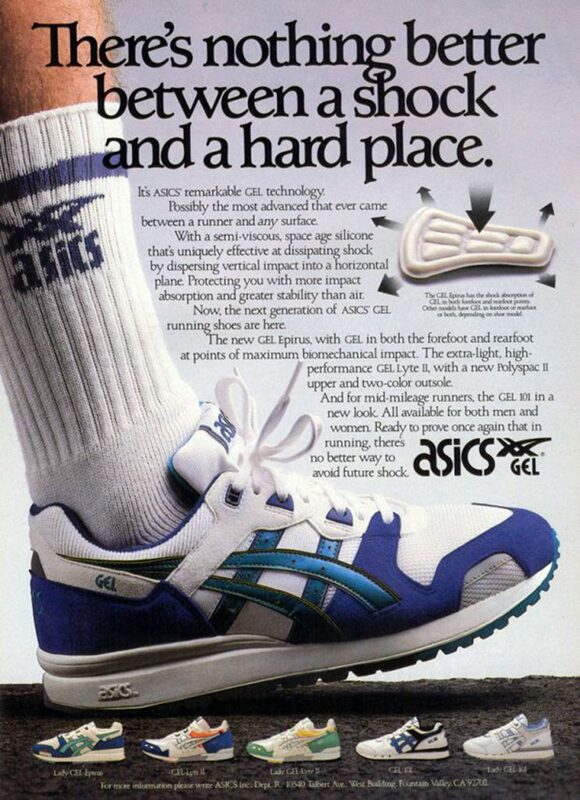 ASICS enlisted Taica as its official supplier and first announced the new tech in 1986 under the name Alpha GEL System. Boom! The space-age cushioning system was welcomed by the running community as the key to reducing impact-related injuries, reducing vibration and perhaps even shaving a few key seconds off those long-distance running records. 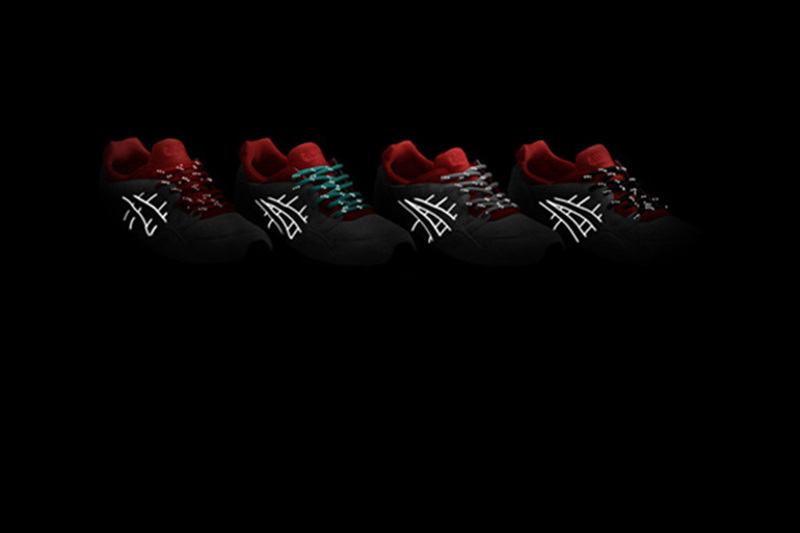 The audience was listening, now all ASICS had to do was package their GEL system into a banging silhouette. Get your freak on. 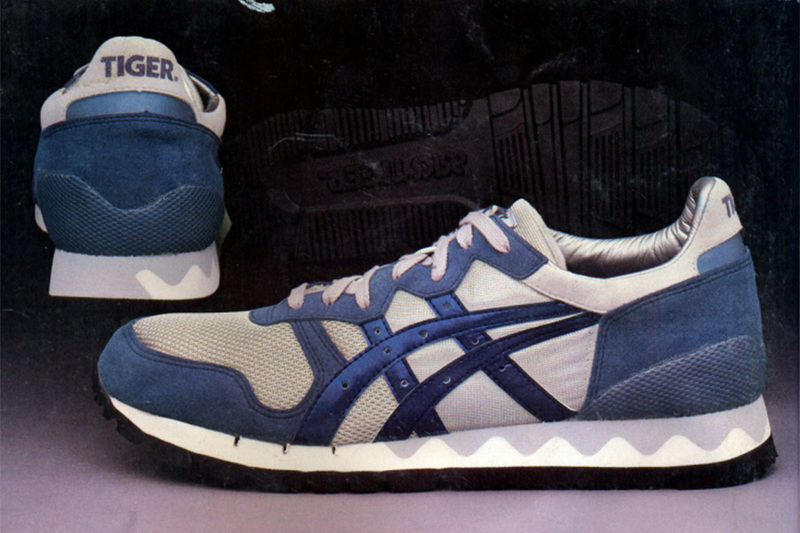 Japanese runners received their first taste of walking on GEL with the Japan-only release of the Freaks Alpha model in 1986. 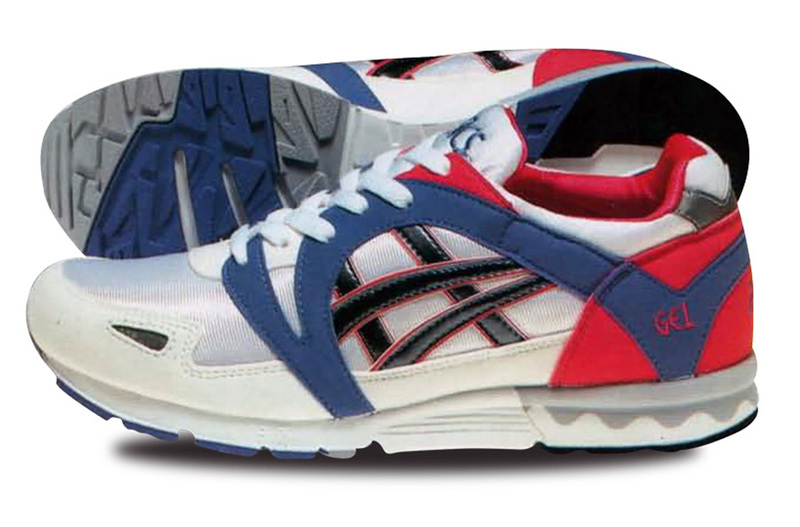 The jogging shoe followed the classic ASICS runner formula, paired with Alpha GEL technology in key impact zones on the heel and forefoot, together with stylistic updates: An elongated heel section provided extra grip on the tracks, while “freaky” style was added by ways of reflective silver hits. While runners in Japan started getting their Freaks on with GEL technology, their peers in North America and Europe had to wait a bit for the drop of the GT-II model – with less “freaky” styling – for the experience. But once everyone tried GEL, the running world was hungry for more. 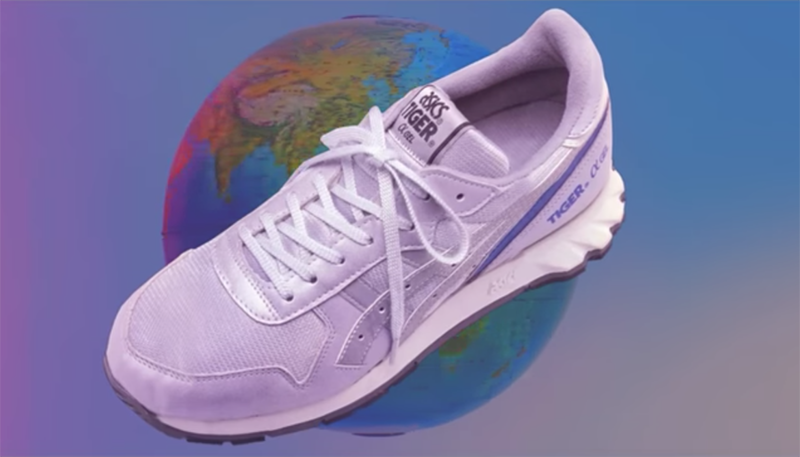 Behind the scenes, ASICS Tiger already had a global shoe drop lined up that would take GEL technology to the next level. Calling all serious runners! 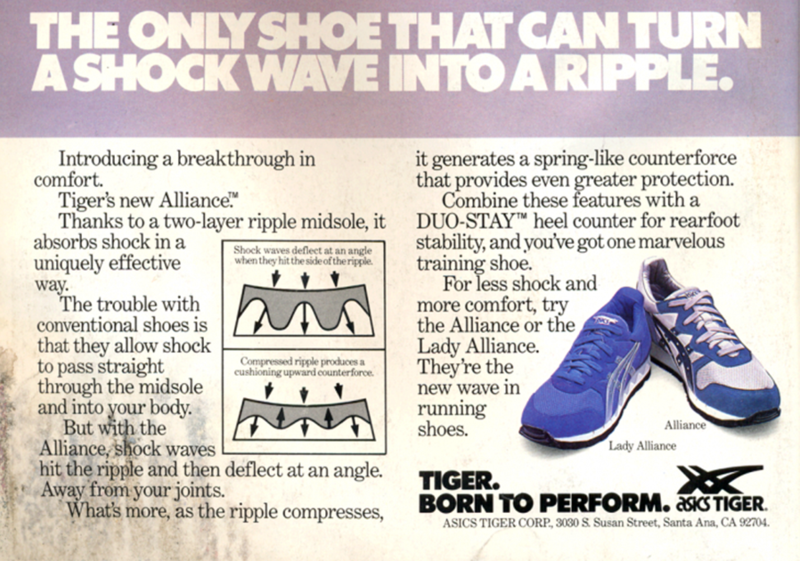 In 1987, athletic running magazines across the world heralded the arrival of something new. 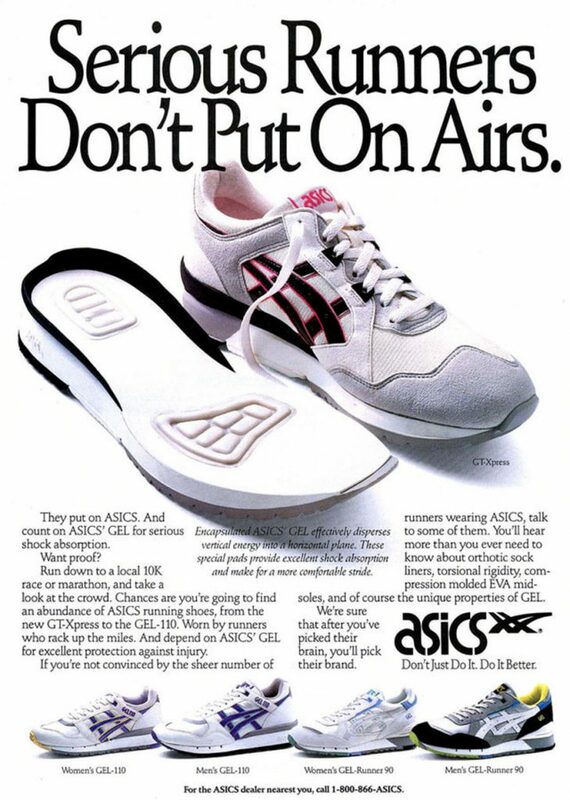 “Speed freaks, we’ve got your number… it’s 9.9,” read the ASICS advertisement, announcing a shoe that was only 9.9 ounces light – which was light as a feather at the time. Named the GEL-Lyte for its “intimidating lightweight,” the new silhouette featured nylon mesh inserts and Alpha GEL technology under the heel. 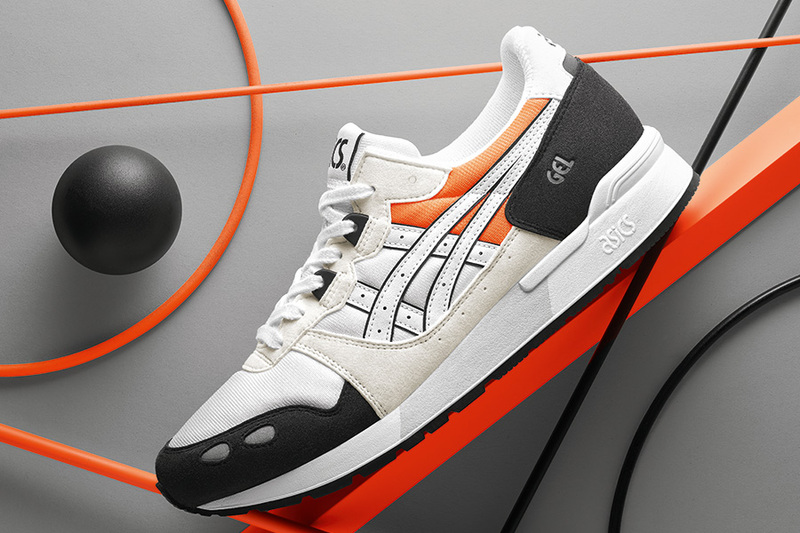 The shoe’s use of color-blocking in a classic white, black, and neon orange colorway – supplemented by reflective panels added to the upper for safety – single-handedly created the stylistic formula for the entire GEL series. And of course, there was more to the shoe than style: True to the advertising promise “we don’t take speed lightly” (see what they did there? 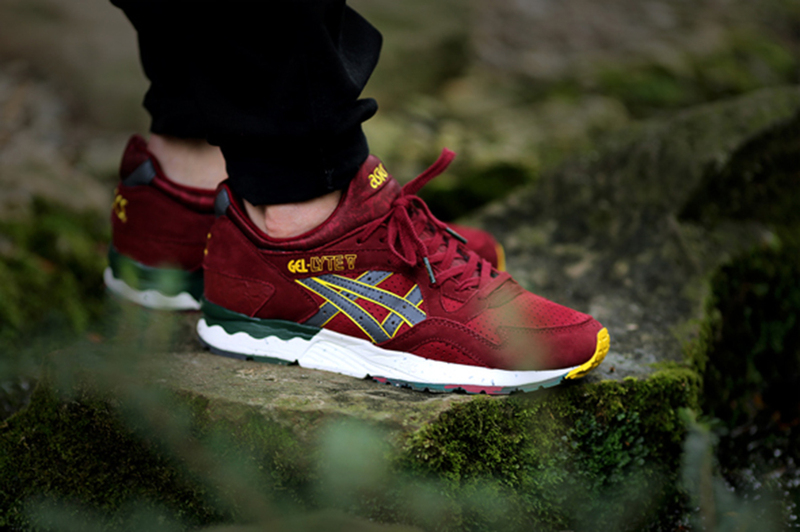 ), the ASICS GEL-Lyte was all about Kihachiro Onitsuka’s philosophy of better performance through better technology. 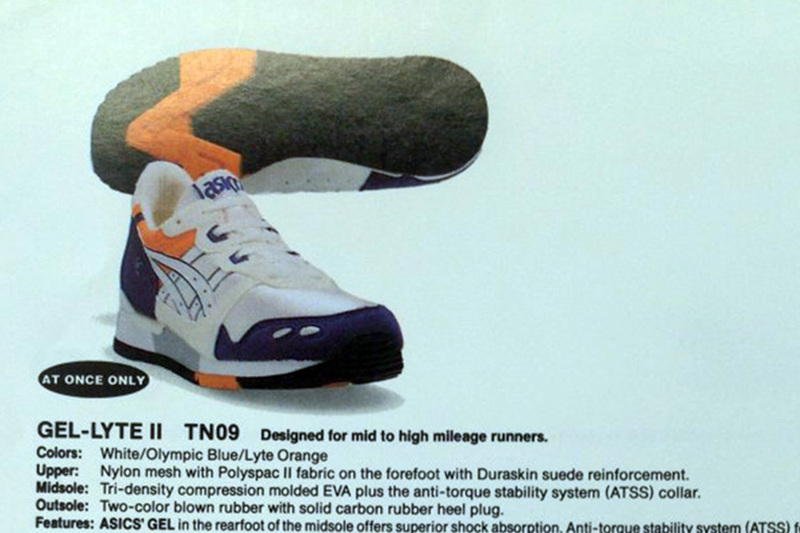 It made history as the shoe that helped a generation of runners go faster with carefully appointed tech features such as a tri-density midsole and anti-torque stability system. Runners didn’t like the new ASICS shoe – they loved it. And they were ready for more. Another one. Many fans out there will argue that The Empire Strikes Back, released as the second Star Wars film, was by far the best entry in the entire series. 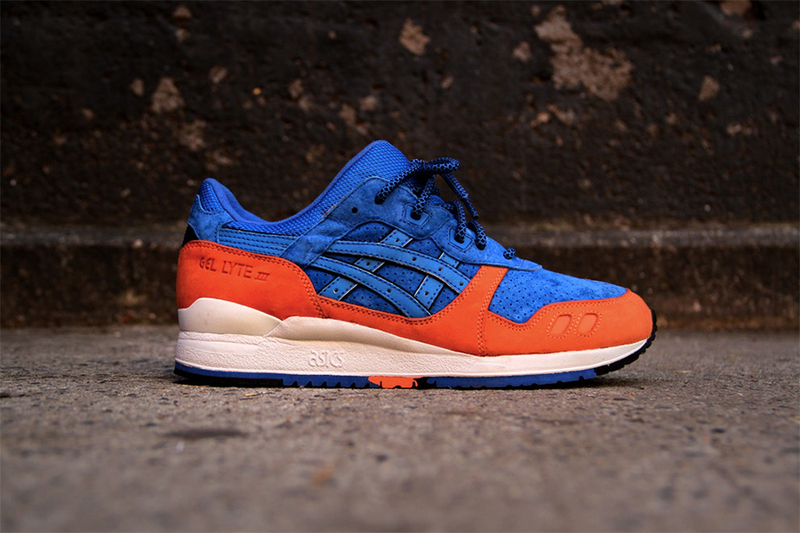 Not too many folks will make such an argument about the second Asics GEL-Lyte, however. Third time’s the charm. 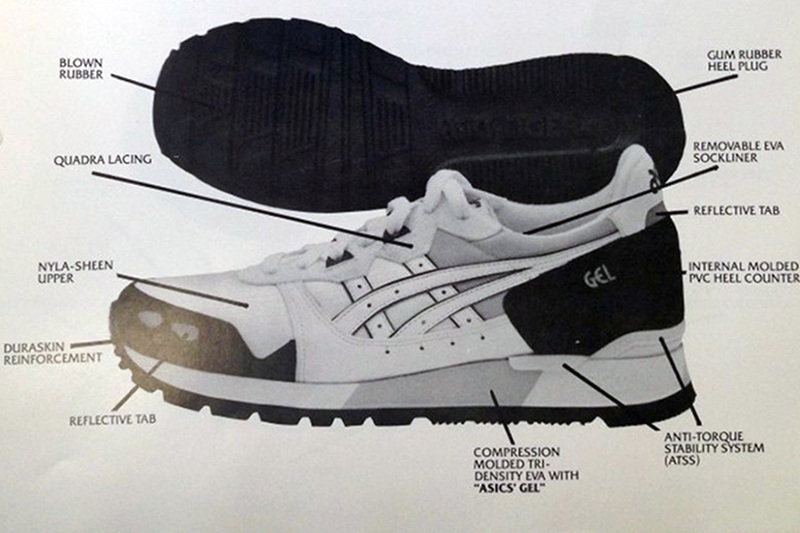 The next entry into the GEL-Lyte series created the blueprint for the quintessential ASICS runner. 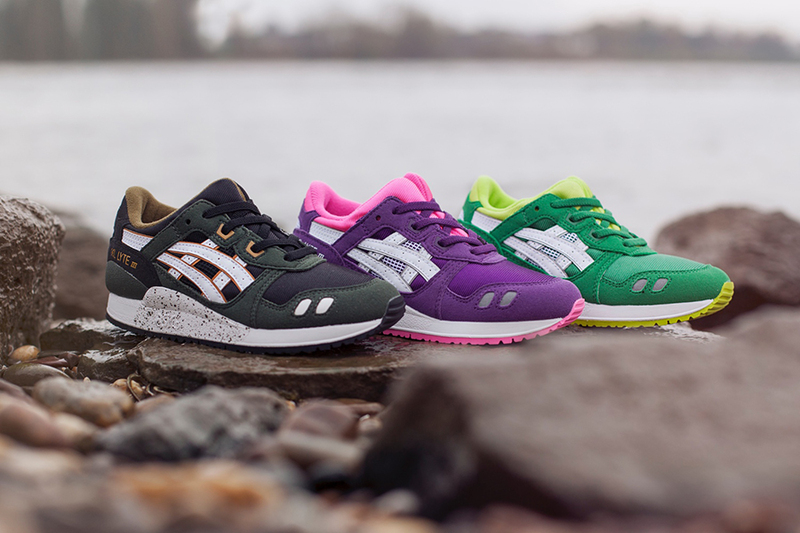 Even more than 25 years later, the GEL-Lyte III remains one of the most cherished and recognizable silhouettes in footwear history, joining the ranks of classics such as the Nike Air Max, adidas Stan Smith, Puma Suede, and a few select more. 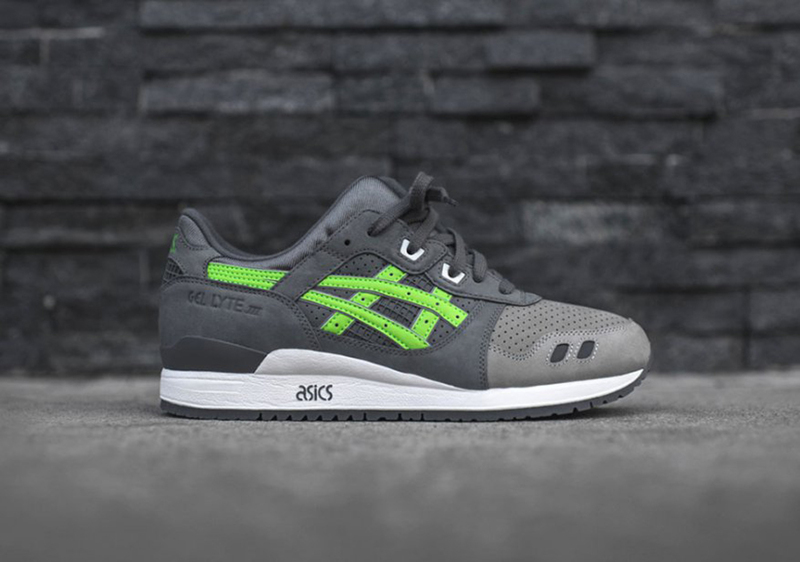 Created by ASICS footwear designer Shigeyuki Mitsui, here’s what made the GEL-Lyte III such a classic: The shoe introduced a split-tongue design for a more contoured fit and better overall stability. It was a real game changer, with the tongue parting down the middle as runners stepped into the shoe, only to contract and seal in the foot for an ever-so snugly fit. Additional winning features included a triple-density sole and carefully positioned GEL cushioning. 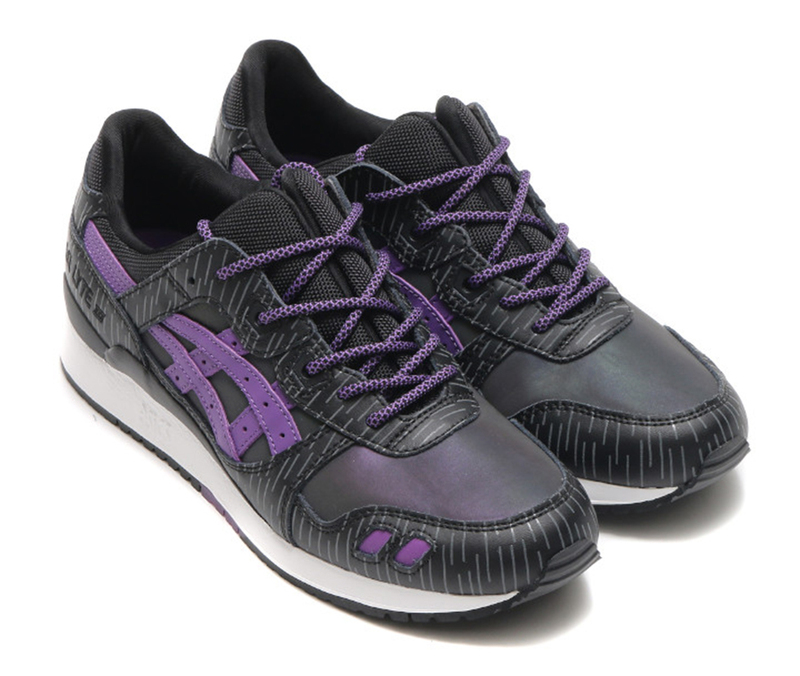 And while “visible Air” had already become a huge feature for Nike, ASICS raised the bar with “visible GEL” in the GEL-Lyte III’s heel tab. 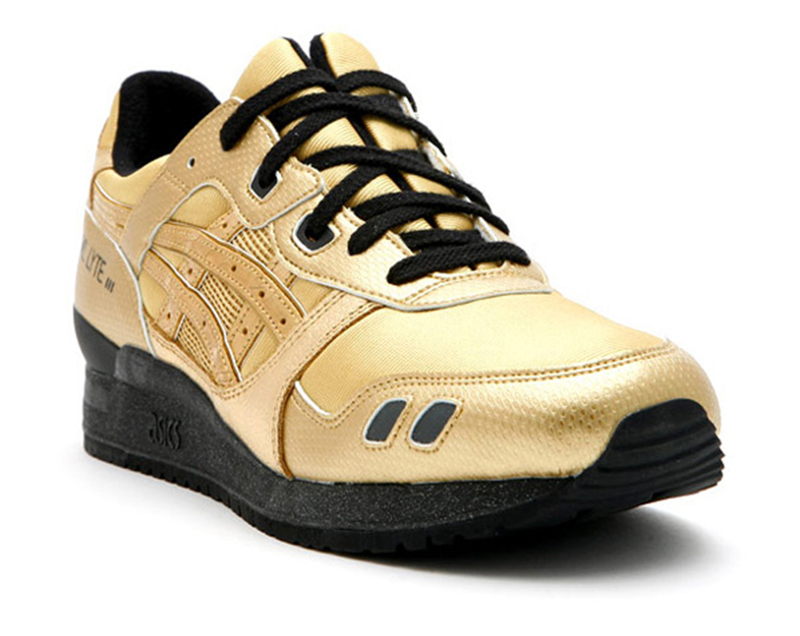 From a cultural perspective, the GEL-Lyte III’s high-tech marketing messaging and elevated price point – plus style features such as the reflective heel panel and color blocking – helped to make the transition into the lifestyle segment a small step for ASICS on the wings of “athletic chic”. Who said that high-tech footwear makers are immune to superstition? 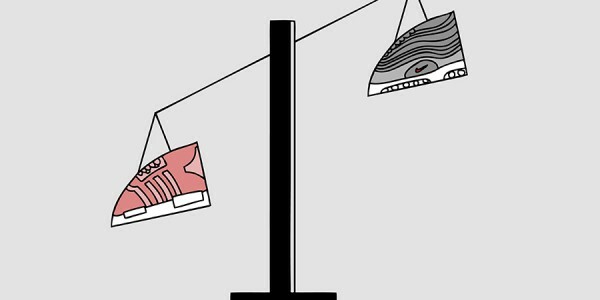 When the time arrived to create a sequel to the GEL-Lyte III, ASICS opted against creating a GEL-Lyte IV, because the number four is associated with bad luck in Japan. 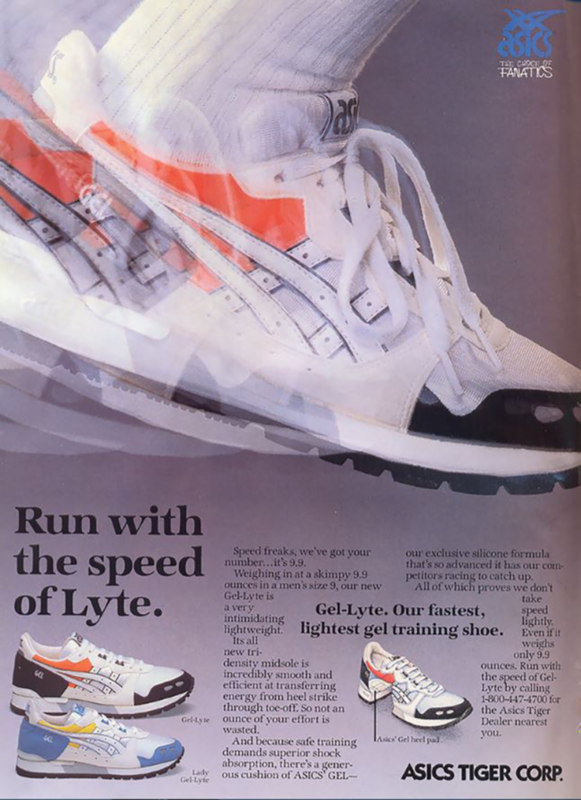 Instead, the world welcomed the GEL-Lyte Ultra in 1992 as the official follow-up, which proceeded to change things up quite dramatically: Most visibly, the split-tongue design was gone, replaced with sock liner “mono” tongue fit while the upper was divided into an entirely new panel pattern. 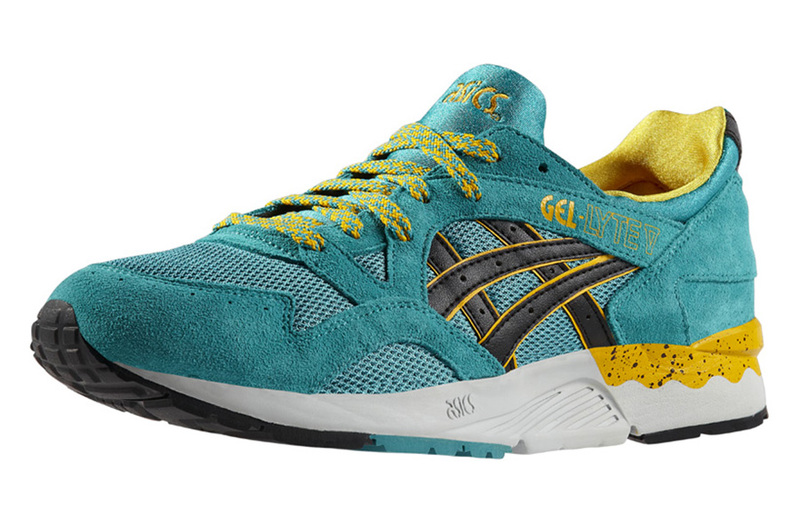 GEL tech was added more generously in the GEL-Lyte Ultra, including a Porous GEL wedge under the forefoot in combination with the heel cushioning. The shoe received an all-new wavy dual-density midsole, the outsole also received an update for an entirely new form-fitting flex. Another fan favorite appears. The GEL-Lyte V combined all the learnings from previous iterations into a sleek, performance-boosting package. Taking the new upper design of the Ultra and pairing it with mesh inserts on the side panels and toe box created a progressive, slimmed down aesthetic. Under the hood, the “V” implemented GEL padding around the heel and P-GEL at the forefoot for extra comfort on long-distance run. 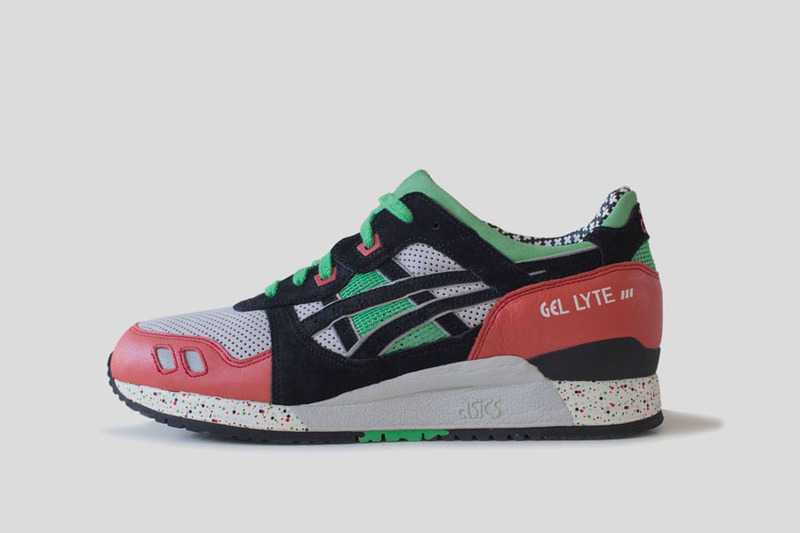 And speaking of long distance: Over the years, the GEL-Lyte V would prove the most enduring entry of the series with the most retros and collabs right after the shining star, the GEL-Lyte III. Don’t be distracted by 1993’s arrival of amazing GEL evolutions like Toshikazu Kayano’s GEL-Kayano. Yes, it became a classic – often re-released, even today – with its visible visible Theta GEL heel cushioning and flex-grooved outsole. 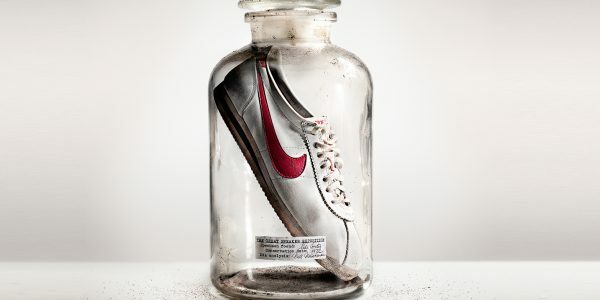 And yes, it became a darling of marathon runners and sneakerheads for decades. 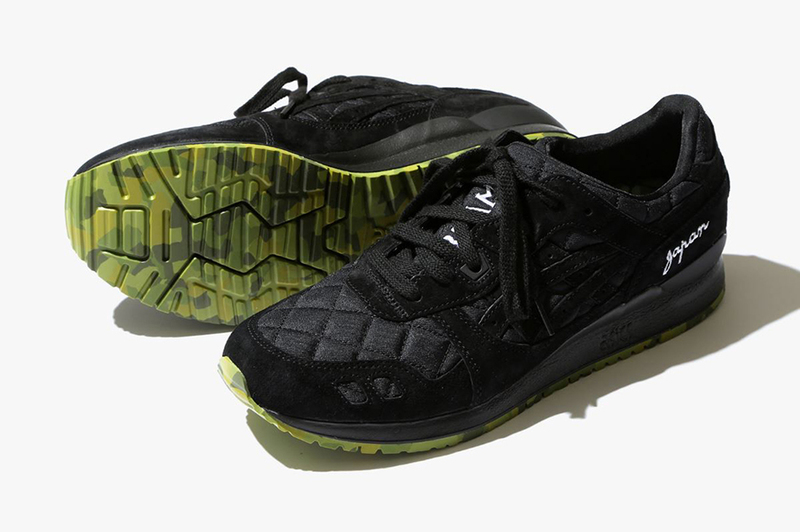 But no, the GEL-Kayano is no direct descendant of the GEL-Lyte family, which remained missing from the footwear universe as if it had crawled into a hibernation pod, hit the cryo-freeze button, and floated off to a decade-long journey to a galaxy far, far away. Return of the Jedi. 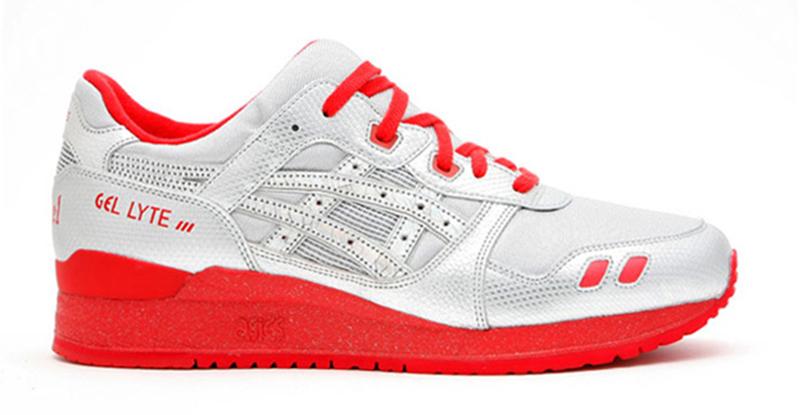 In the mid-2000s, ASICS started quietly bringing back the GEL-Lyte III in limited runs. Although running technology had evolved over the years, GEL still proved highly relevant and functional, as did Shigeyuki Mitsui’s carefully appointed anatomical panelling and support structure. Runners were happy that the shoe they liked was coming back in style. 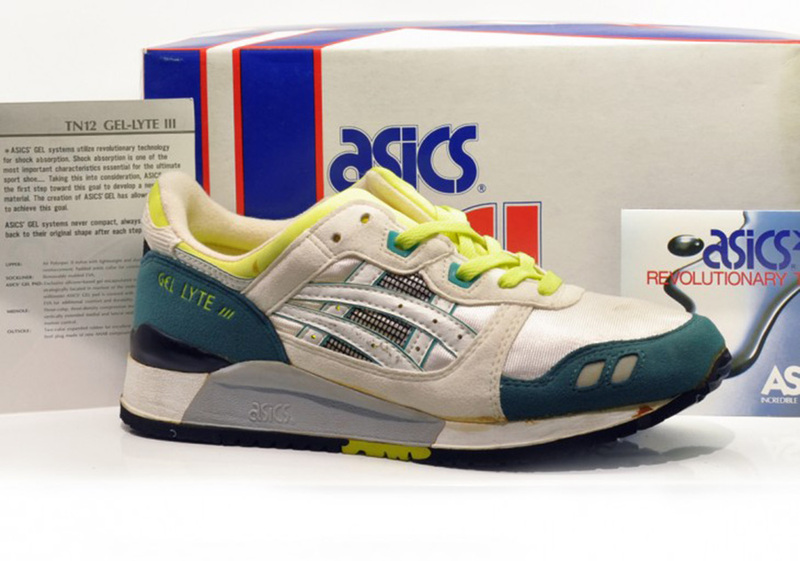 But what really blew the GEL-Lyte III revival into the stratosphere was when leading sneaker outfits across the world connected with ASICS on exclusive collabs. 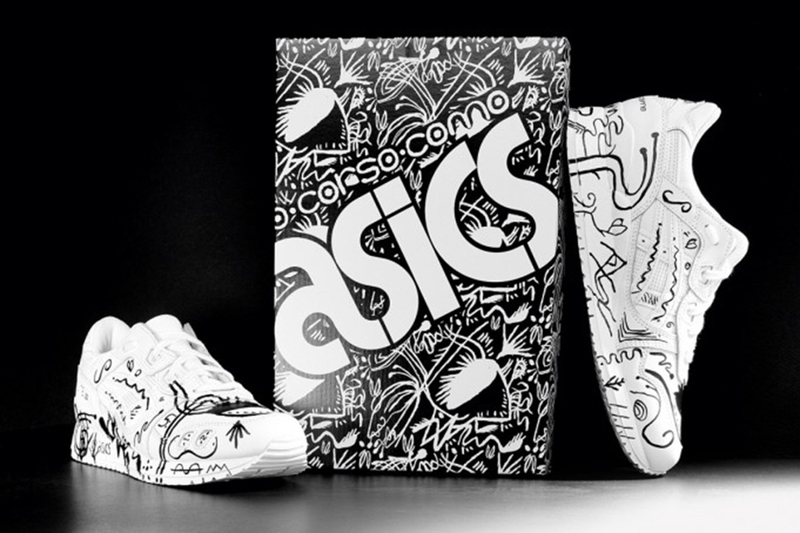 The year 2007 unleashed a wave of stylish GEL-Lyte III releases involving designers, artists, and stores. 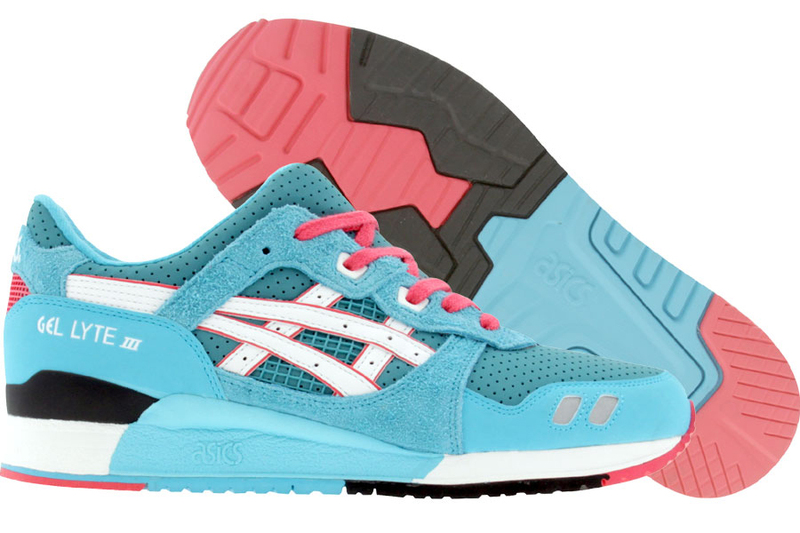 Some of these shoes have become grails in the process, and the legacy of GEL-Lyte III releases continues until today. Here are some standouts over the years. Camp-out mania! In June 2007, Amsterdam’s Patta knocked one out of the ballpark. 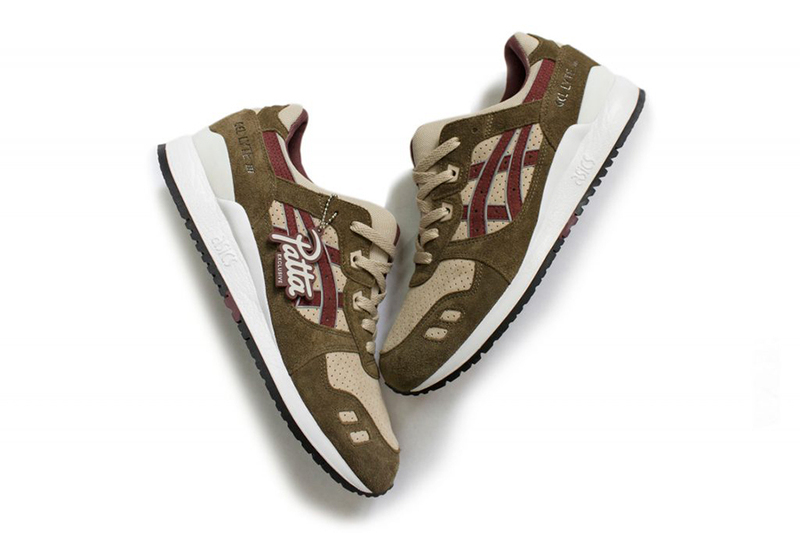 The ASICS GEL Lyte III was Patta store’s first co-branded shoe with a major footwear label, it set the bar high for using the upper’s color paneling, inside lining, and midsole ornaments to create something bigger than the sum of its parts. The color story was inspired by the red and black on the city of Amsterdam’s coat of arms with a healthy dose of Patta green. Accompanied by matching softgoods such as tees, New Era Hats and a varsity jacket, this one made history – also by causing the first campout outside the store. No they didn’t! 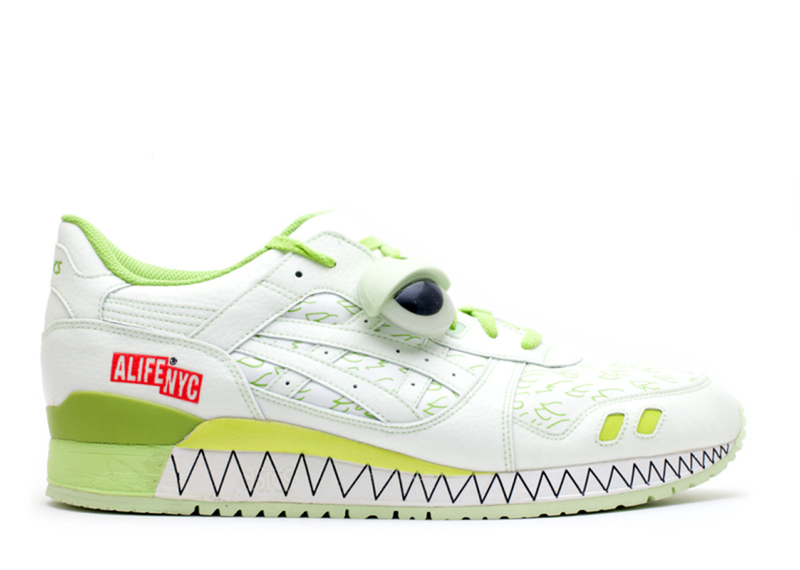 Who in their right mind would put googly eyes, sharp teeth, and monster skin patterns on a shoe? 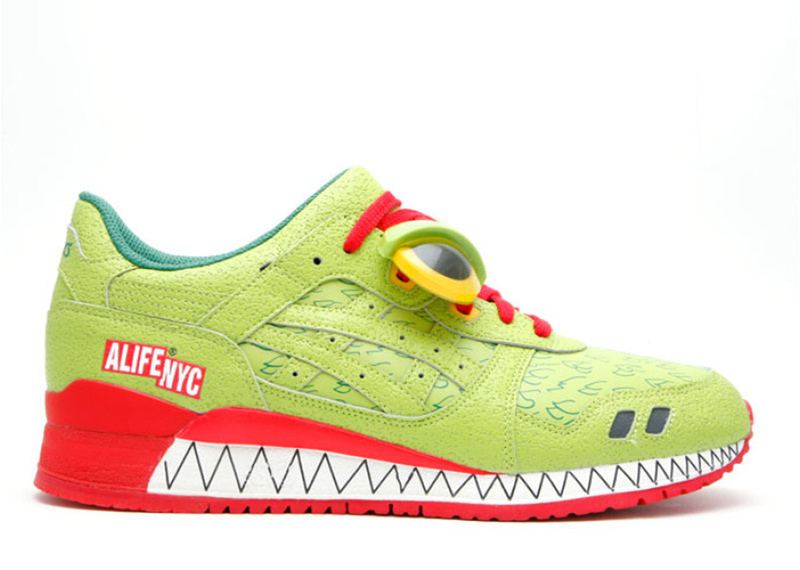 The folks at ALIFE is who, and not just on one shoe, but two versions of the ASICS GEL-Lyte III in 2007’s “Monster Pack”: The “Green Monster” and “Black Lagoon” crawled out of the swamp and into the streets in a highly limited release. Even more limited: The Friends & Family “Kryptonite” model with its glow-in-the-dark upper – if you spot one today, it’s as rare as seeing Bigfoot. This one added fuel to the flames. 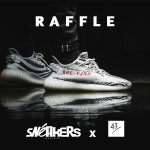 For the 25th anniversary of New York sneaker boutique David Z, designer Ronnie Fieg created this double release of 200 pairs each in Stainless Steel and Solid Gold variations. 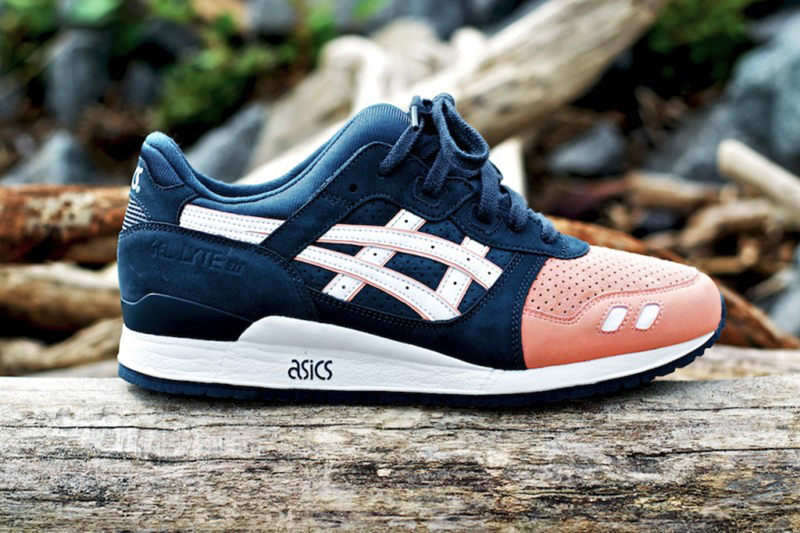 Released during the 2007 Holiday season, the drop paved the way for many Ronnie Fieg collabs – this man was a huge part of the shoe’s entire revival – on the ASICS GEL-Lyte III to come. 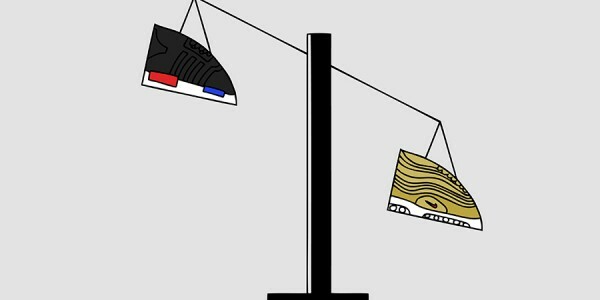 There is only one shoe that changes color under the sun. 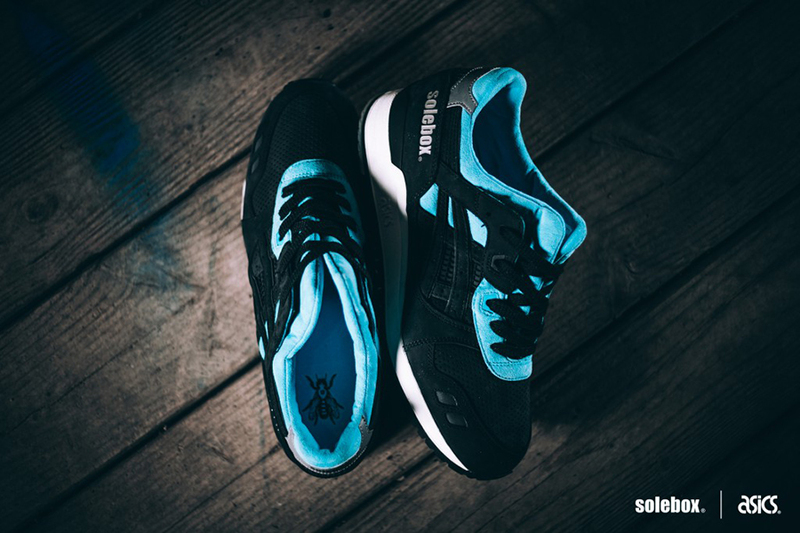 Hikmet Sugoer of Solebox fame went beyond stylish colorways and materializations by equipping the ASICS GEL-Lyte III with a light-sensitive midsole. Brilliant! Also make sure to watch the amazing launch video showing folks across Berlin raising their shoes to the sun. Powerful stuff! 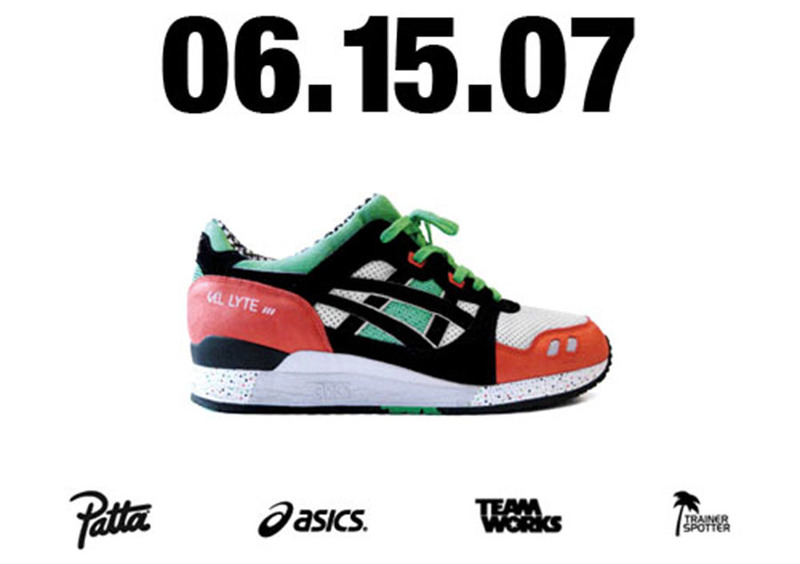 Ronnie Fieg strikes again. 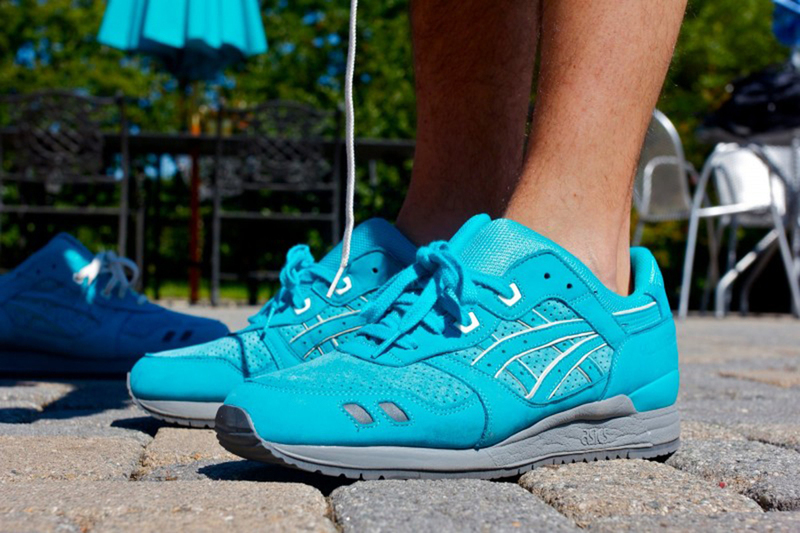 Keeping the GEL-Lyte III buzz going, 2010’s “The Cove” model brought Caribbean inspirations into the streets with high-quality suede in a brand-new shade of blue. 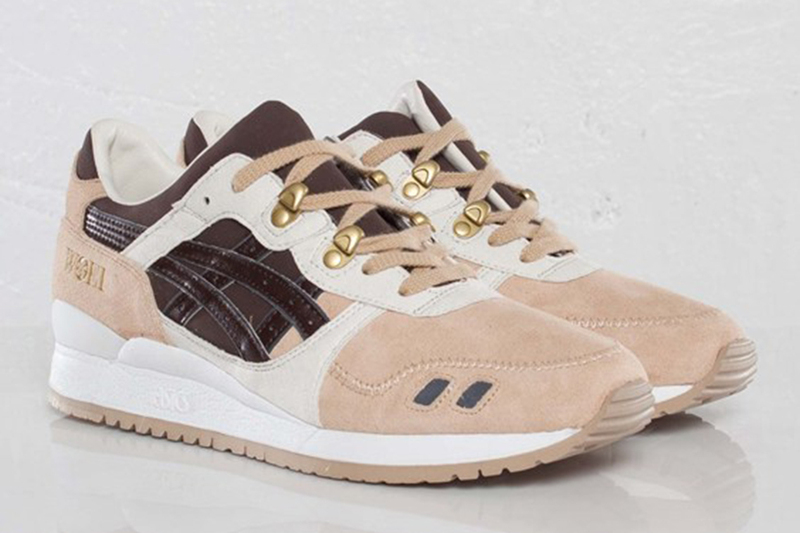 One of the finest moments in ASICS x Ronnie Fieg history. Hot, hot, heat! Shipped in a special dust bag featuring the “Keeps On Burning” logo by Hanon, this drop was inspired by the Wildcats running club. 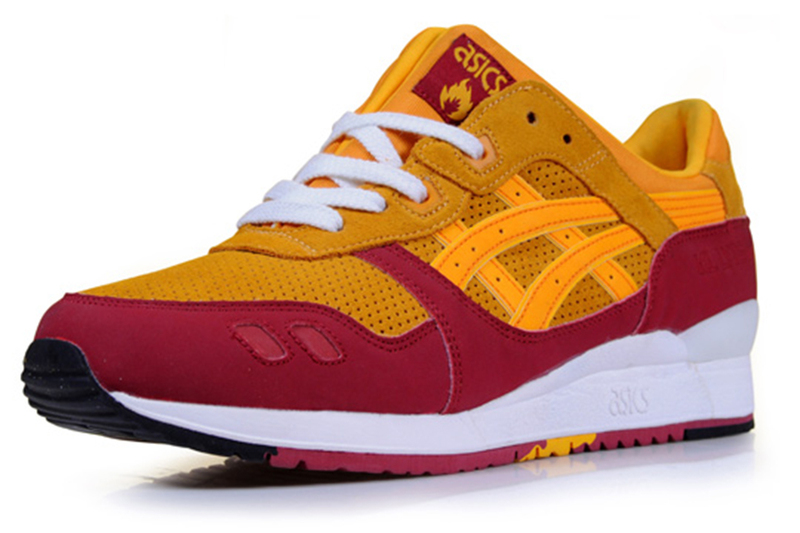 The orange and red upper was blazing hot and showed that revival of the ASICS GEL-Lyte III was more than a sizzle in the pan. Rawr, rawr, like a dungeon dragon. Online shoe retailers Pick Your Shoes went and picked a stylish colorway for their limited edition turquoise, red, and white “Teal Dragon” colorway. Initially available online at the modest price point of $80.00, this one really roared like a dragon on the re-sale circuit. So fresh, so clean. 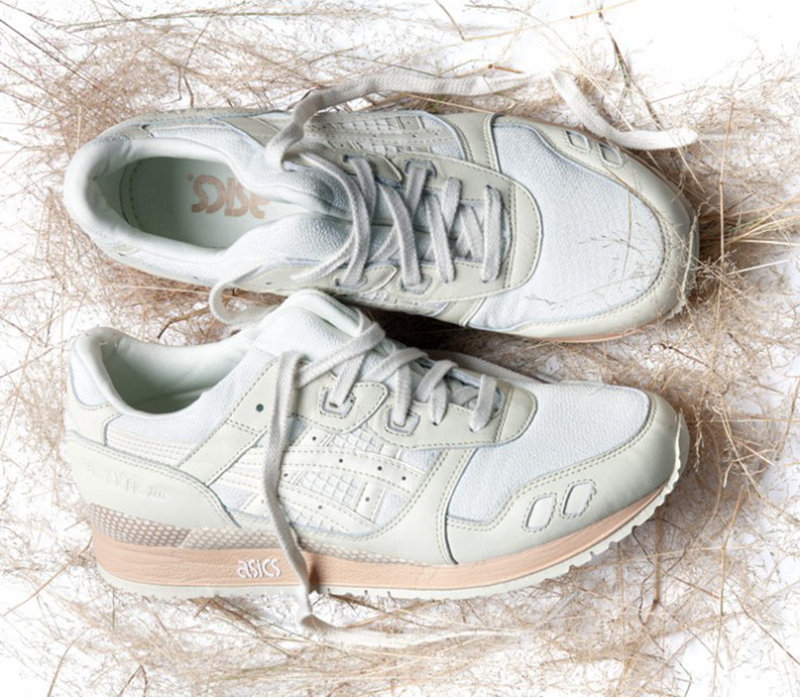 Tokyo-based designer David Guarino distilled the GEL-Lyte III to its pure essence in a light-colored drop featuring an all-white upper paired with creme-colored accents on the midsole. The ivory upper introduces Chirimen fabric, traditionally used in kimono manufacturing, while customers also received a special set of Zillion laces. Now listed as deadstock, the shoe sells – not for a zillion – but North of $2,000. What a catch! 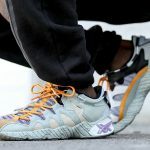 For the grand opening of his Brooklyn-based KITH store, Ronnie Fieg pulled a special ASICS GEL-Lyte III release out of the water. The strictly limited “Salmon Toes” featured a navy upper with the toe box dipped in a salmon colorway. Only 72 pairs were available on September 30, and finding one swimming around the resale streams today is a rare sight. Let’s hit the outdoors. Celebrating the fifth anniversary of Rotterdam sneaker store Woei’s, they teamed up with ASICS on the trail-inspired GEL-Lyte III “Cervidae.” One of those collabs that illustrate the power of materials to render the same silhouette in an entirely different light, this one also replaced the upper eyelets with trail hooks to take the GEL-Lyte III for a walk through nature. Lights out. 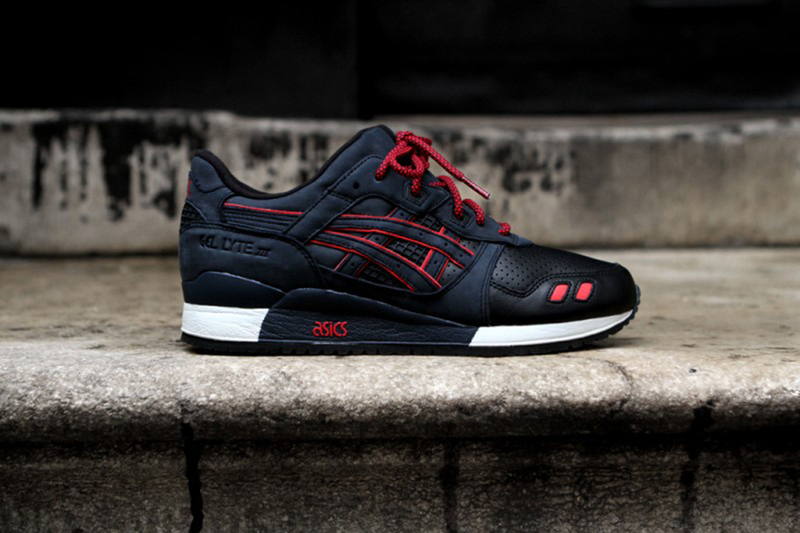 With a sleek dark upper featuring black and navy, contrasted with sharp red lines, Ronnie Fieg once again proved the GEL-Lyte III’s stylistic versatility in the “Total Eclipse” release. Materialized in half and half nubuck and leather, this one saw the lifestyle runner make the leap into the nightlife. So bright, it should come with sunglasses. 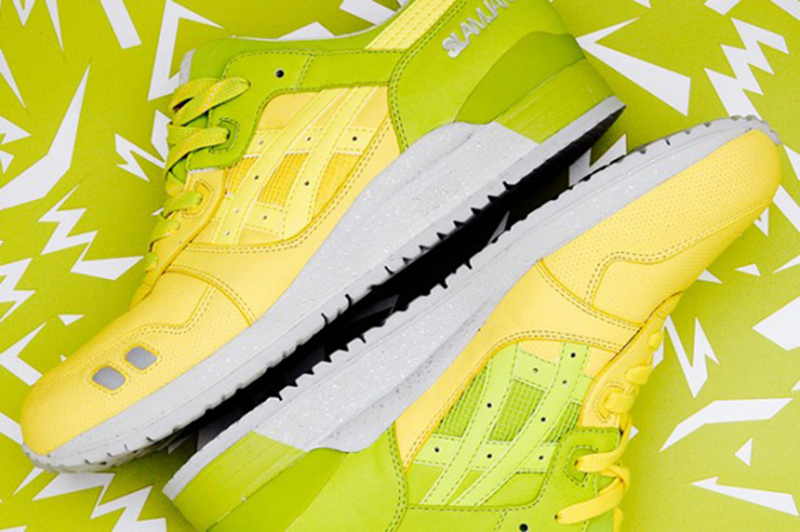 This December 2012 release in cooperation with Italian retailer Slam Jam brought a healthy dose of neon to the table: The Slam Jam x ASICS GEL-Lyte III sparkled with yellow-green panels on the upper, complemented by reflective ASICS stripes, speckles of silver on the midsole and bright laces. Released in December it brought a much-needed injection of colors to drab winter streets. Big shout on the East Coast. 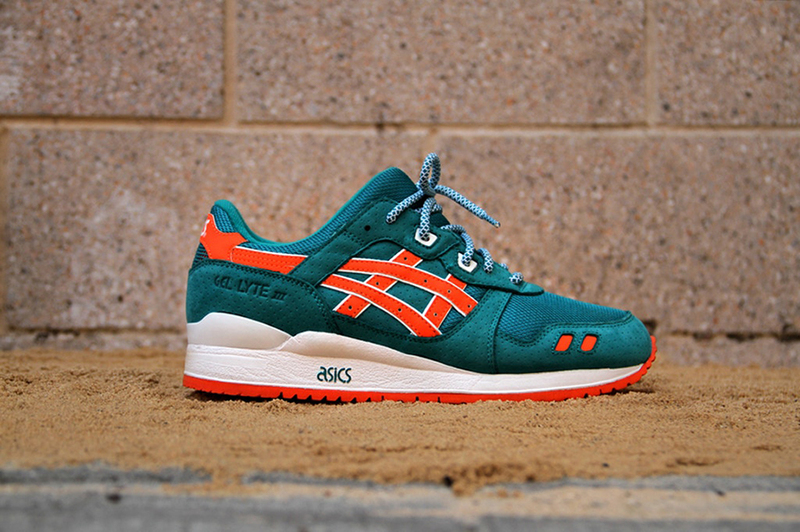 The year 2013 marked the arrival of KITH’s basketball-inspired East Coast Pack, featuring ASICS GEL-Lyte III versions themed around “New York City” and “Miami Beach”. 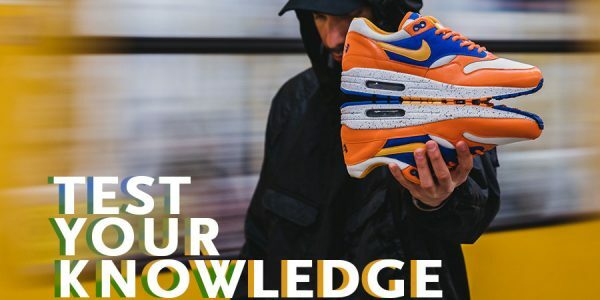 The NYC version is obviously based on the official New York Knicks colors, rendering the pigskin suede and soft nubuck upper in royal blue and orange. Meanwhile, the Miami Beach version gives a nod to the Miami Dolphins team with an orange and white upper composed of breezy micro-perforated nubuck and woven mesh. Historic side note: KITH sold the shoes at a pop-up store in Miami at the time, three years before making a permanent footprint with a Miami Flagship. Turn off the lights, and it’ll glow. 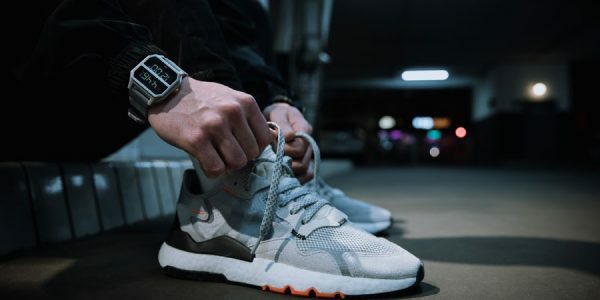 Night running was the inspiration behind this summer 2014 release of the Asics GEL-Lyte V: During the day, the release struck a stylish note with a grey suede upper, some red reflective accents and a dark grey speckled midsole. But viewed at night, it cranks up the heat with reflective stripe accents and lace imprints, while the red sleeve really comes to live. Big things! 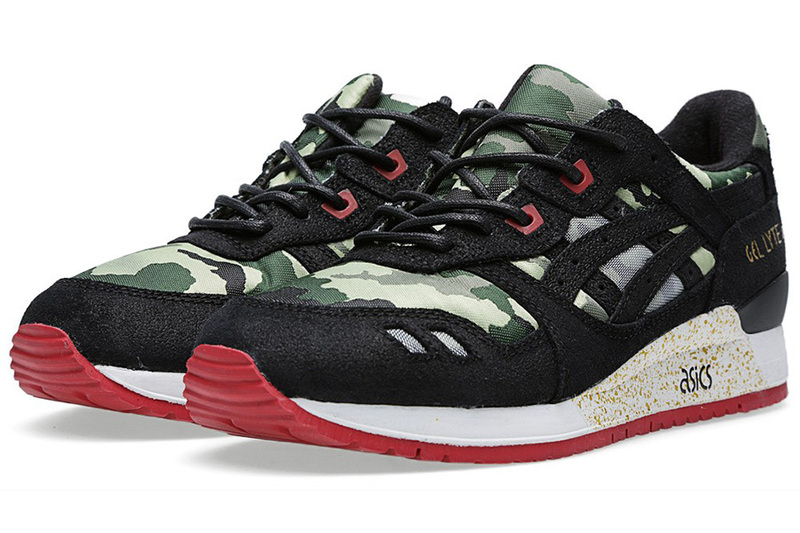 One year before the GEL-Lyte III’s official 25th anniversary, the stylish folks at BAIT dropped a trifecta of styles for the ages: The “Nippon Blues” model elevated the silhouette with Japanese style Kasuri textile and nailhead suede on the upper. 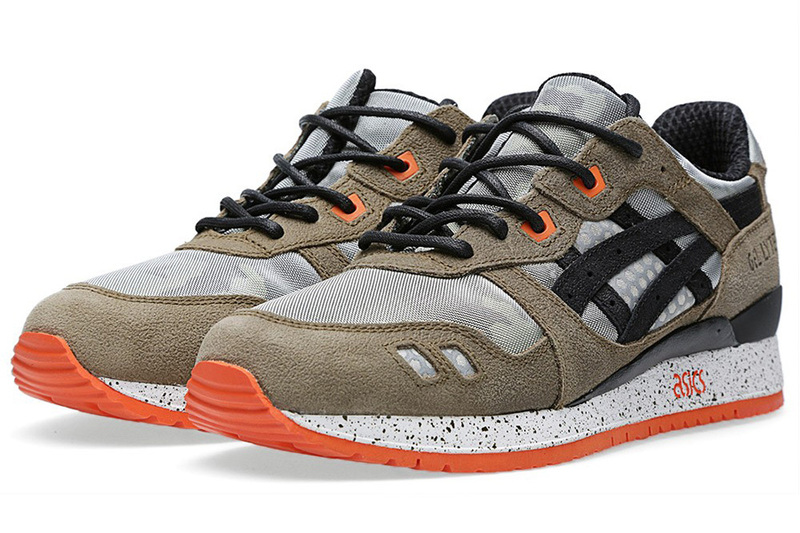 Meanwhile, the military-inspired “Guardian” and “Vanquish” models offered smart plays on the use of camo and army fatigue colorways such as tan and olive, supplemented by finer details such as dust speckles on the midsole. Boom! Wait, who’s stealing the spotlight again? As the (sneaker) world prepares for the arrival of the GEL-Lyte III’s 25th anniversary, the other fan favorite takes center stage: Released in October 2014, The Good Will Out x Asics GEL-Lyte V “Kojo” drew inspiration from nature. “The Kojo is inspired by the colour of the Japanese autumn leaves. Koyo is to the Japanese autumn what cherry blossoms (Sakura) are to spring.” This collobaration featured a burgundy and red upper, made of premium nubuck leather, with carefully chosen color splashes throughout. Let’s get this party started. 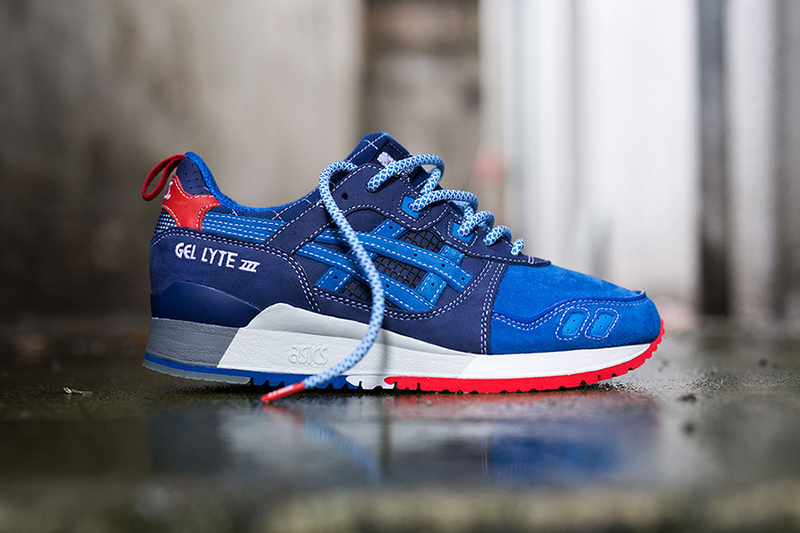 This January 2015 release in collaboration with Japanese sneaker store Mita kicked off festivities for the Asics GEL-Lyte III’s 25th anniversary. 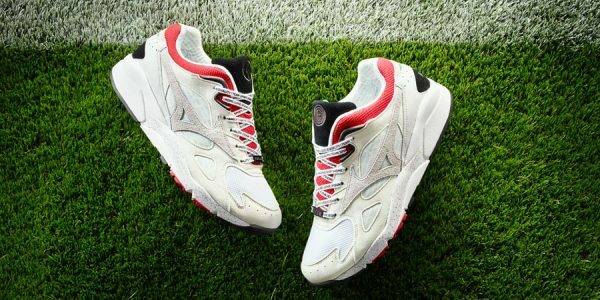 Straight out the gate, it set the bar high for what special anniversary releases needed to deliver: premium materials, lush colorways, carefully appointed color contrasts (that red outsole! ), and finer details like branded lace tips. Way to get the ball rolling. Inspired by birthday cake. 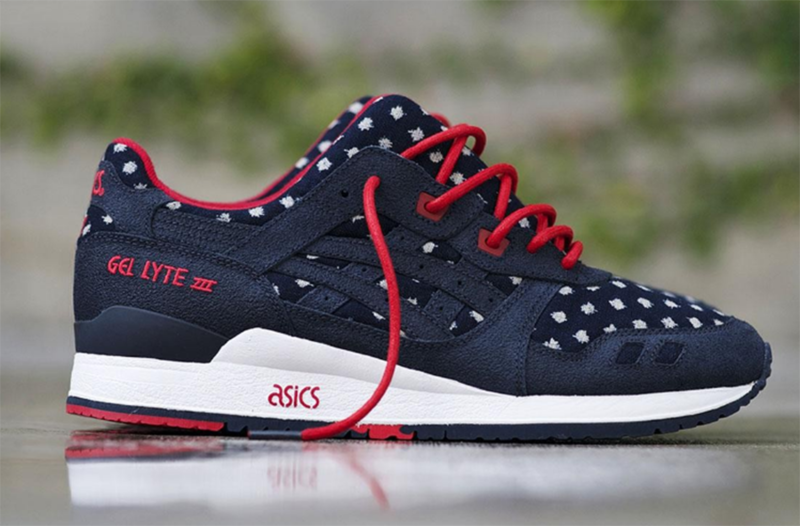 When it comes to the ones who kept the faith in the GEL-Lyte III all those years, Atmos also deserves honorable mention. 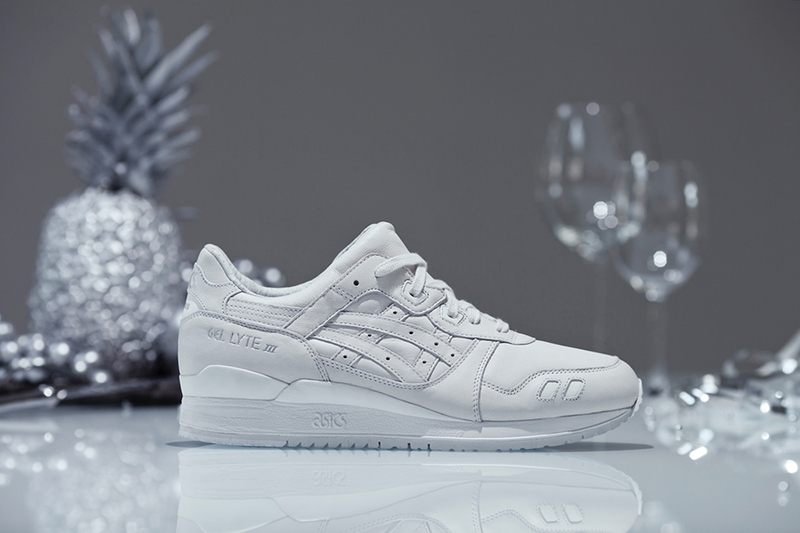 And they know how to set a festive birthday dinner table: For the 25th anniversary, Atmos joined the party with one of the cleanest GEL-Lyte III’s ever, executed in white-on-white with only the tiniest silver details. Tasty. Military precision. It’s all in the details for this 25th anniversary drop courtesy of FOOTPATROL London: The “Squad” features morse code of “FOOTPATROL GEL_LYTE III” on the laces and a “FOOTPATROL SQUAD” patch on the tongue, paired with the shop’s gas mask logo. 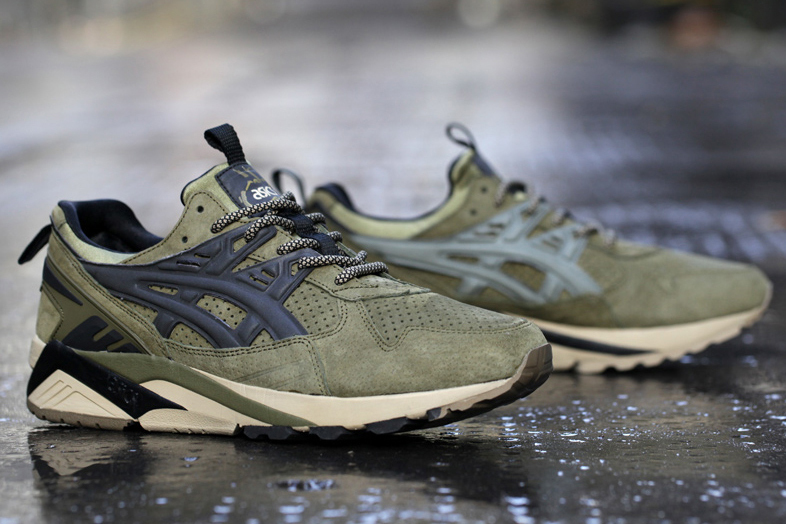 The main part of the suede upper is rendered in olive, while the tiger stripes feature black on the lateral and golden accents on the medial. Crispy. Let the little ones have some fun. 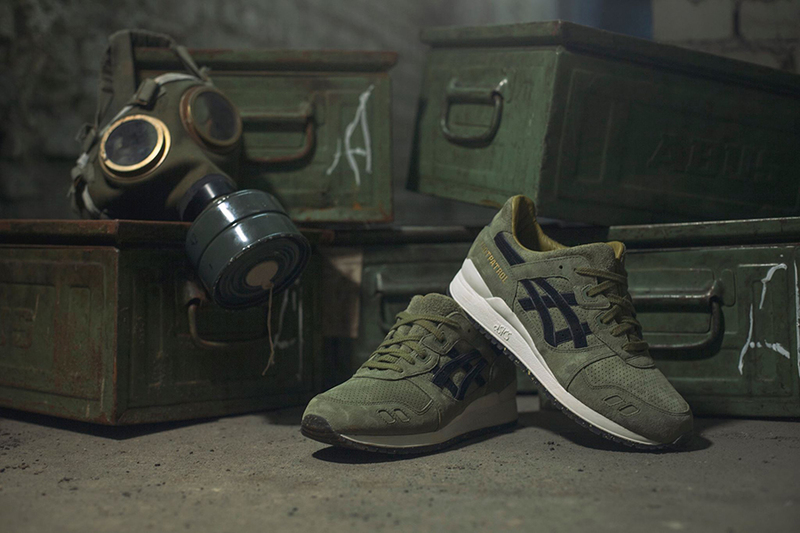 After all major footwear brands saw great success with mini-versions of their iconic silhouettes – because sneakerheads are dads now – ASICS Tiger finally released some of their most popular footwear styles such as the Gel-Lyte V and the Gel-Lyte III as special kids versions in small sizes. Nightmare on GEL Street. California’s BAIT has played a key role in the GEL-Lyte III revival with numerous amazing collabs throughout the years, so of course they were invited to dream up a shoe for the 25th anniversary. The “Nightmare” is one of the GEL-Lyte III’s most upscale editions: rare and valuable materials include Tilapia suede, suede with reptile print, tanned leather from Japan and a great leather for the lining. Combined with black metal Mesh, silver Metal mesh and 3M hexagons BAIT created a beautifully dark twisted fantasy that sold out in a flash. Light up the night. 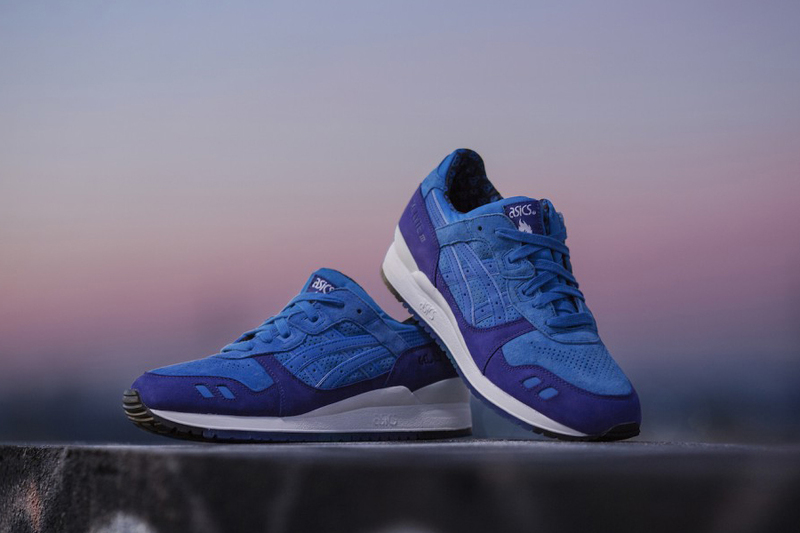 The folks at Hanon in Aberdeen brought back the “fire” emblem from their Wild Cats collab for the GEL-Lyte III’s official 25th anniversary on a special edition: The “Light Night” colorway is inspired by the color of the air at the time before sunset and sundown – blue on blue goodness made this one a highlight of the anniversary release circuit. Sleepless nights. 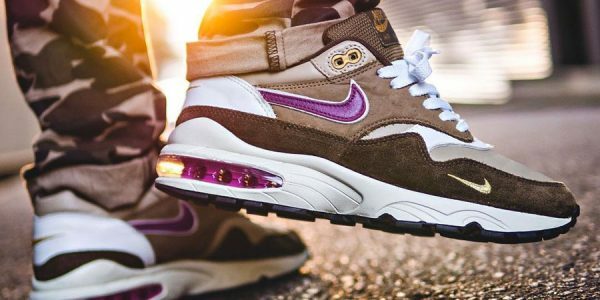 ATMOS took inspiration from the city of Tokyo’s unlimited flow of energy in a stylish release with luxe materials. To hear ATMOS tell it: “With the use of a special type of 3M, the colour of the shoe changes in contrast to the light that hits it. In addition, a pattern using reflective materials is visible throughout the entire shoe, representing the bright lights of Tokyo’s building signs against rain at night.” This one sold out overnight, literally. 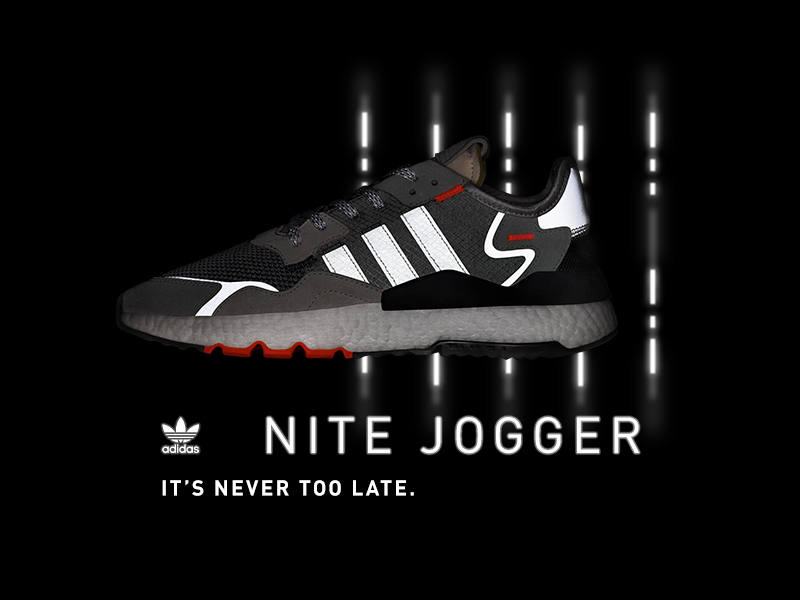 Run with the latest trend. The year 2016 saw a huge streetwear craze for “souvenir jackets,” basically aviator jackets with Japanese-style lettering and embroidery, made famous by U.S. soldiers in the aftermath of WW II. Bringing these stylistic elements to footwear, ASICS teamed up with BEAMS and MITA to create a “souvenir jacket” themed GEL-Lyte III. The upper is made from a mix of black Suede and quilted textile and sits on a black midsole with a green contrasting outer sole. The heel, the side and the split tongue feature embroidered logos and a “Japan” tag – characteristic for souvenir jackets. Nice story, nice shoe. Ultra-limited. 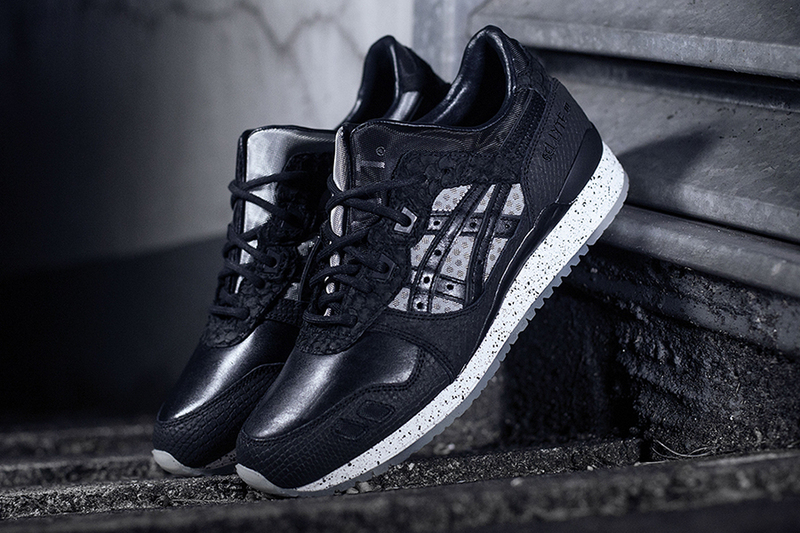 For its 25th anniversary, Milanese art gallery 10 Corso Como took the ASICS GEL-Lyte III into the territory of high art – in a highly limited run: Only 50 pairs of the black-and-white 10 Corso Como x ASICS GEL-Lyte III were produced. All models of the run featured painting in the hand-lettered style of U.S. artist Kris Ruhs together with individual numbers on the heel. Pretty enough to put in a display case? Good things come to those who wait. Announced for over a year, this Ronnie Fieg special finally dropped in May 2016 for KITH store’s fifth anniversary. 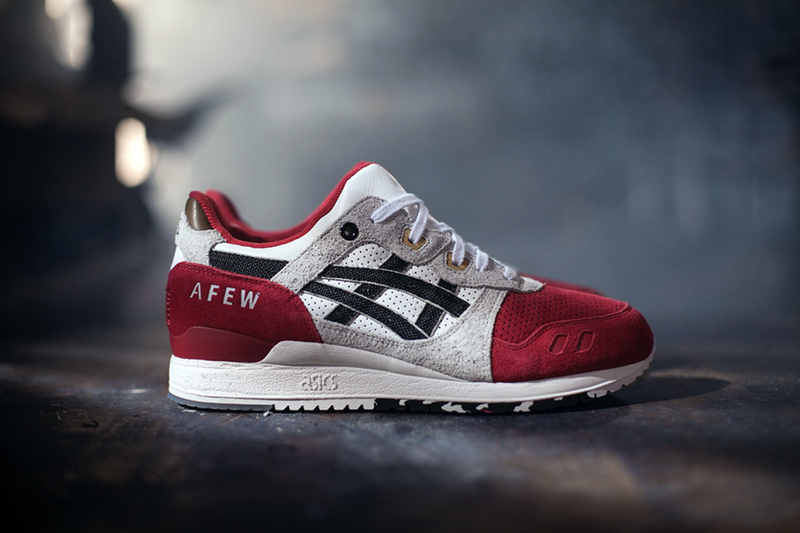 Only 700 pairs were handmade in Japan to provide superb quality for an exclusive release that initially sold at $250. Sneaker heads are ready to drop some green on this one, as it currently ranks at $750 on the resell circuit. First things first. 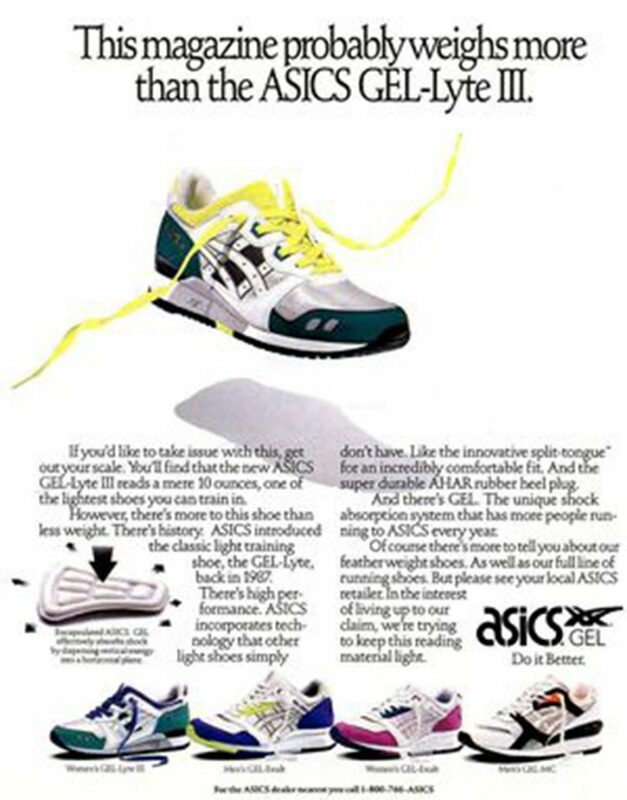 Before the GEL-Lyte silhouette saw the light of day, 1986 marked the arrival of GEL technology in ASICS footwear. 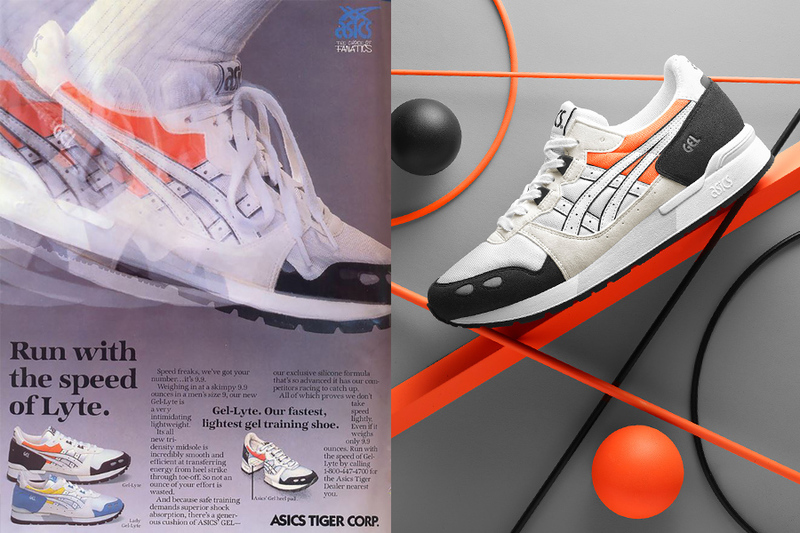 Celebrating the 30th anniversary, the company dropped the Gel-Lyte III and the Gel-Lyte V as well as the GT-Cool Xpress, which was the first shoe with visible Gel-Elements in the early 1990s. All three silhouettes are covered in black, which is broken by light blue accents and which is a sharp contrast to the clear white midsole. Upscale materials round out a nice birthday drop, and whet people’s appetites for more festive releases. Taking it back to the classics. Amsterdam’s Patta paid homage to the classic silhouette and their roots with ASICS with this June 2017 release. 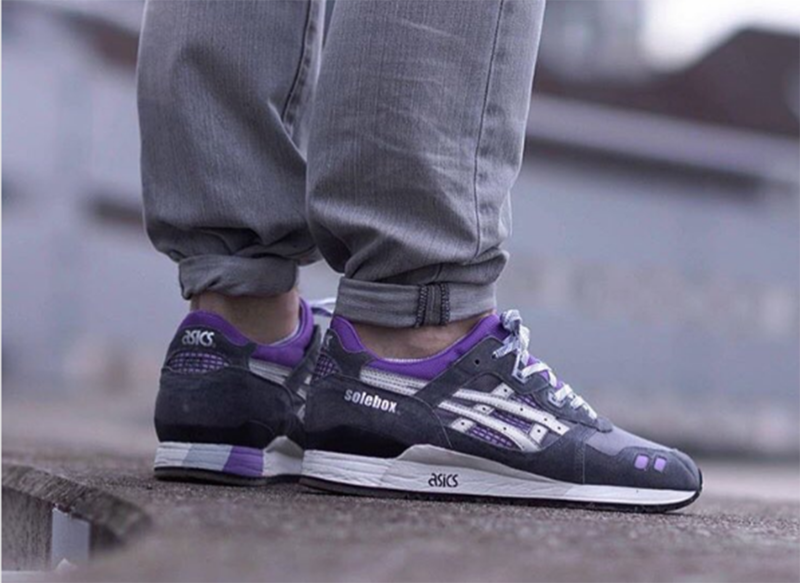 “The classic ASICS GEL-Lyte III, which also happens to be the model of choice that jumpstarted Patta’s relationship with ASICS in 2007. 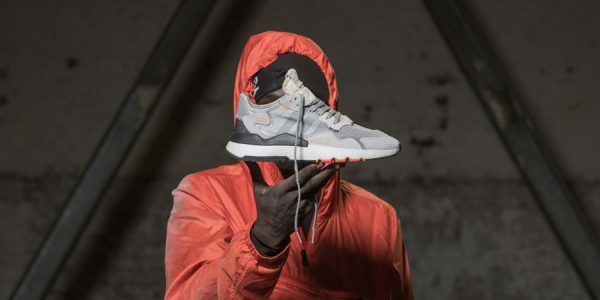 Patta and ASICS have chosen for an SMU to bring back the feel of the old sneaker scene, bringing back the times where sneaker releases were about a certain model and colorway, and not about who’s the collaborating partner or the exclusivity of the product. 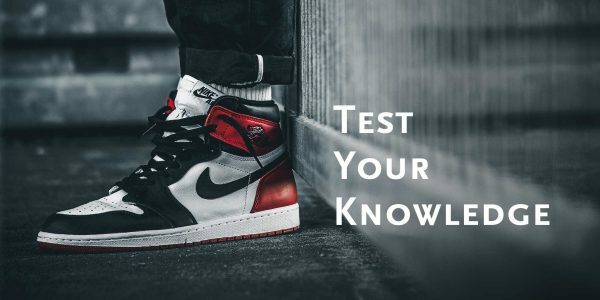 We want to give every sneaker enthusiast a chance to purchase the shoes.” And purchase they did, as this was another hit. Guess who’s back? 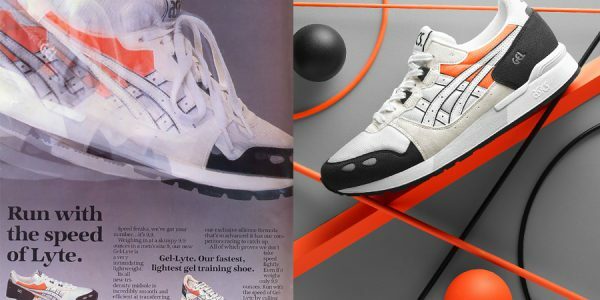 With all the amazing ASICS GEL-Lyte III and GEL-Lyte V re-issues featured in this story, it’s hard to imagine something fans haven’t seen before. But for the 30th anniversary of the silhouette that started it all, ASICS is bringing back the GEL-Lyte Original for the first time in history. 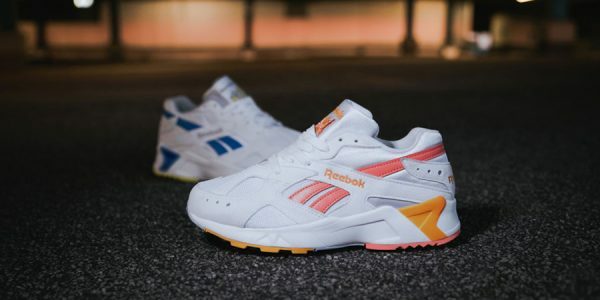 And staying close to the classic, the colorway is the original white, black, and bright orange – plus reflective accents – while the silhouette shines in all its retro glory. Officially dropping on July 7, 2017, this one made the cover of our current SNEAKERS issue as our way of saying congrats to 30 years and running. Happy Anniversary!